Ceiling lifts can provide added safety for caregivers and patients. As well as, greater independence at home. Ceiling lifts are a great solutions to help people with mobility challenges, their families and caregivers, both in constricted and open spaces. Ceiling lifts reduce injuries that can occur when lifting or transferring a person. They are installed on overhead rails (permanent or free standing). And, are ideal to increase safety at home. All of the lifts sold and installed by Safe Living Solutions, LLC are weight tested for safety. Safe Living Solutions specializes in the sales and installation of ceiling lifts, as well as stair lifts, vertical platform lifts, vehicle lifts, ramps and other home accessibility products. Call us today at 336-781-3303 or use the form to the right to get a free quote. Our ceiling lifts are safe and easy to use, require less space than a floor lift, require no special storage and are easy to operate. They are compact, but powerful fixed ceiling lifts that lift quickly and can reduce patient transfer time. The ceiling lift track system (or rail) can be adapted to nearly any home situation. You can install as a simple run from the bed to the bathroom. Or, the install can be complex, such as bed to bathroom to family room to eating area. Portable ceiling lifts are ones that can be moved from one track to another when needed. They are normally lighter and easier to handle. Which, provides greater control and flexibility for the caregiver. Safe Living Solutions in High Point, NC can provide bariatric lifts that are capable of handling much more weight than standard or portable ceiling lifts. 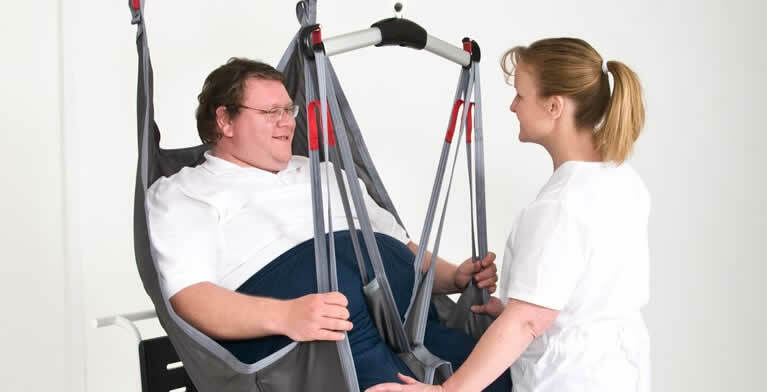 Our bariatric lifts can typically handle weight from 600 lbs up to 1000 lbs. As with all our ceiling lifts, each bariatric lift is weight tested, as are track systems after installation, to ensure the safety of both caregivers and patients. Ceiling mounted patient lifts provide lift solutions needed by caregivers and patients. Families and those utilizing professional caregiving services can benefit from these systems. Using a ceiling-mounted patient lift enables patients to enjoy transfers with more safety and less stress. Many of our lifts have interchangeable slings available that allow patients greater independence. Some of those include, bath to seat transfers, physical therapy-specific slings, optional wireless control, back-up control on motor and mechanical emergency down features. The motor-assisted lift can reduce the strain on caregivers and increase safety for those in their care. Easy room-to-room or station-to-station transfers along track. As well as, transfers to bed, bath or toilet, and from bed to wheelchair. These ceiling lifts are a great solution to help people with daily activities, including bathing, toileting, getting in and out of pools, beds and more. We can customize the ceiling lift system to your needs and home. We can help you select the right ceiling lift for you, then configure and install the ceiling track rail, setup the lift system and teach you how to use it. We have served the Piedmont Triad (High Point, Greensboro & Winston-Salem) for over a decade. 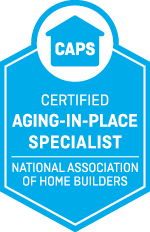 We are professional home accessibility specialists, providing home remodeling and modifications, as well as home accessibility products and installation. We have partnered with some of the biggest names in lifts and accessibility products, including Harmar, Mo-Lift (a division of Etac), EZ Access, Precision Lifts, Prism Medical / Handicare and many others. Our High Point ceiling lifts can help you gain the independence you are wanting or help you care for your loved one at home. Our products are designed with the caregiver in mind. They are perfect for home use, because they are built like healthcare equipment. They can provide you with a new feeling of confidence, as they will help with even the roughest patient transfer needs. Contact us today to speak with a knowledgeable ceiling lift professional who will be happy to answer your questions.